I've been pretty busy testing my scratch-made palette. Here is an example of an experimental picture I did the other week. In anticipation of painting full time again, my focus has shifted more towards refining the colors I've already made. This is a process with virtually no end. While it requires a lot of patience, its also fun. I feel a little like an archaeologist or treasure hunter. I've been doing a lot of map reading, research, talking to geologists, and driving around filling little baggies with material. Here are a couple recent finds. I took a road trip to a geologic formation that I suspected might contain quality yellow clays. It was exciting to find this sample. Mixed with oil, this yielded a deep, golden ochre. 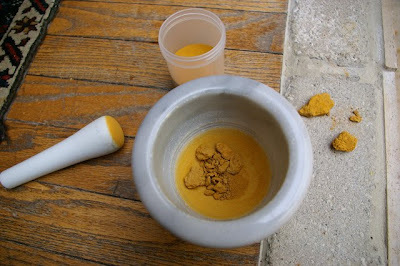 This brought back memories of a great color I used back in Italy, named Roman Ochre. I feel the red ochre I've been using so far is not what I want it to be. Most of the red clays I've been able to find in my state are a little too orange for my tastes. Before I stopped using this color, I decided to try an experiment. 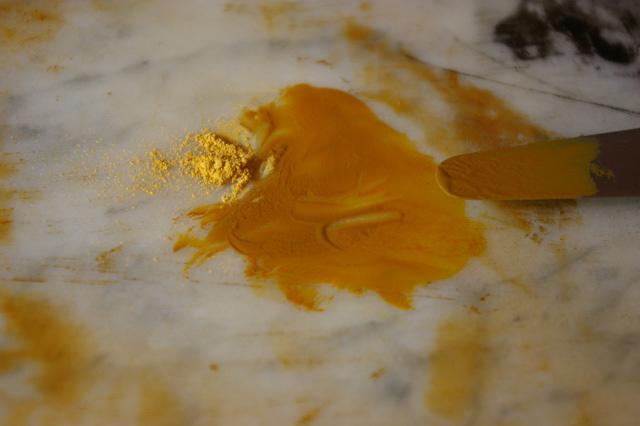 The ochres and other clays get their color from the Iron Oxides contained within them. Iron Oxides are normally a rusty red color. These clays become lighter in color when they bond chemically with water, becoming Hydrated Iron Oxide. Yellow Ochre is an example of this. 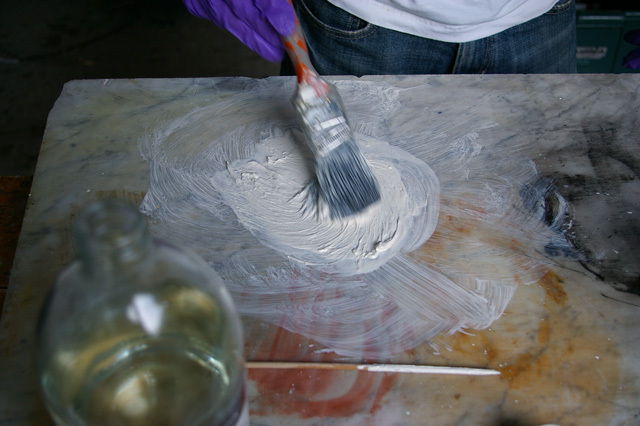 If a lighter clay is heated, the water will be released, and the clay will become red again. This occurs in nature, and is also done in paint production. Artists colors of this type are designated by the "burnt" label in the name. 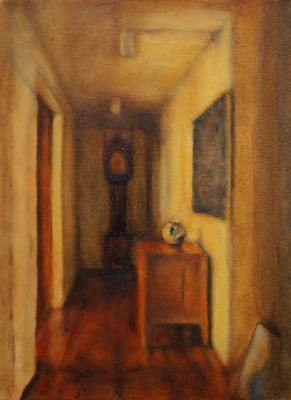 An example is Burnt Sienna. My experiment consisted of trying to do the same at home. 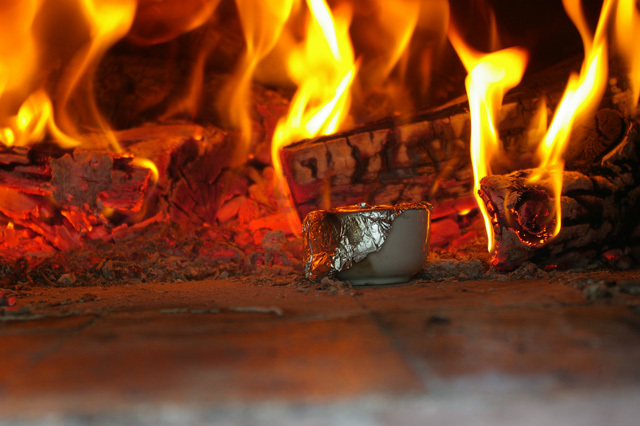 I put my red ochre in a crucible, covered it in foil, and placed it inside the family's wood oven. I watched as the color became more and more red. After several hours, the change seemed to have stopped, so I removed it and let it cool off. A side by side comparison. 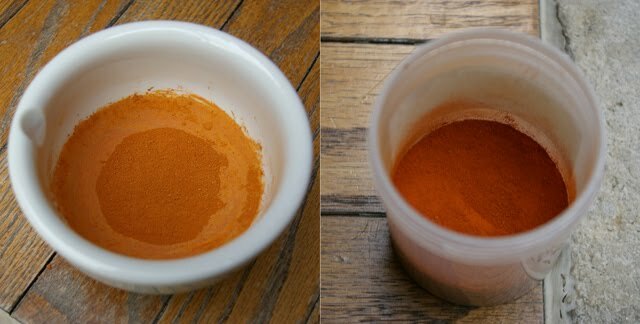 The image on the left is the pigment before it was heated. As you can see on the right, the pigment has become much much redder. It still has an orange undertone. I would consider my experiment a success. The frame complete, I stretched my canvas. It is important to not stretch it very tightly, like one would normally do when working with pre-primed material. 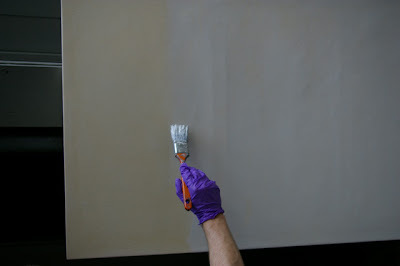 This is because the glue size, when applied, will take up the slack and tighten the canvas significantly. I used copper tacks on this frame, nailed into the backside. Next I heated up some rabbit-skin glue I had prepared in advance. 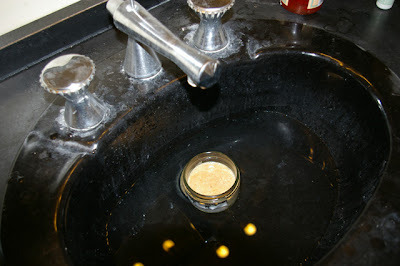 Instead of using a hot pot, this time I tried heating up the glue by soaking the jar in a sink full of hot water. Someone recommended trying this method as the gentlest way to prepare size. Heat gradually weakens the strength of rabbit-skin glue over time, and overheating it can destroy it altogether. So this should provide a stronger glue and reduce the chance of accidentally weakening it. I didn't know going in how well this would work, but after about ten minutes in the sink, the glue turned liquid like it was supposed to. I applied two coats of size. I made sure that the coats were complete and deeply penetrated the weave of the canvas. The next day, I could start the oil priming. For this project I'm trying out the lead oil ground from Williamsburg Artist Materials. It comes premixed, so it just needs to be thinned before it can be applied. Its better to apply a few very light coats rather than one large one. The proper consistency is like a light cream. I applied two coats in all. Then I looked over the whole canvas for missed areas, and reapplied more primer until I was satisfied I had good coverage. I just finished a building a large canvas for a commission. The next few posts will catalog the process of making one from scratch. The main challenge I had in this project was finding suitable wood. The longest dimension was 50 inches, as specified by the client. When I build stretchers, I like to use well-seasoned older softwoods. Older wood was usually grown more slowly than the modern farmed variety. This makes it stronger and more dimensionally stable. Using it often involves reclaiming wood, sometimes reusing planks from old houses or furniture. I wasn't able to find anything suitable at first in my collection, so I reluctantly went out and bought commercial lumber. 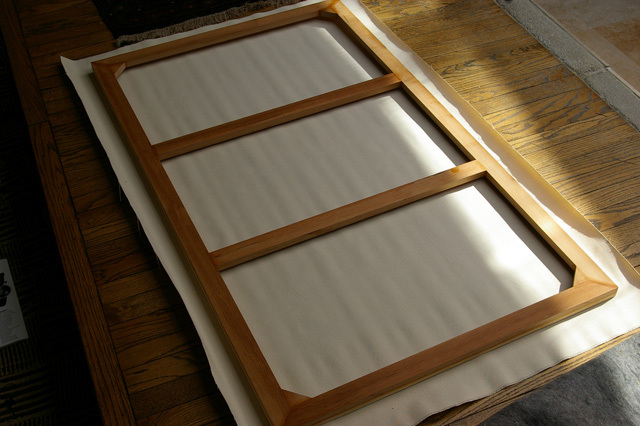 Despite very carefully selecting the straightest pieces I could find, and letting them sit for several weeks, they started warping and bowing severely before I could even put the frame together. This was discouraging. Luckily, I discovered a long plank of softwood, hiding in the rafters. This board was probably older than me, and well seasoned. Even after machining, only one board changed. I went ahead and ripped it into 1 x 2 size boards. 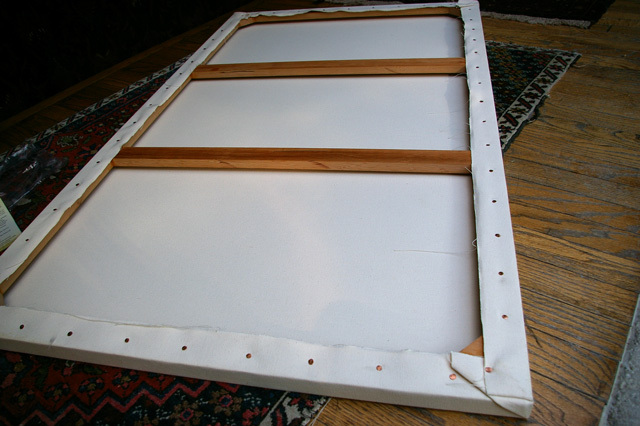 If a stretcher was made with regular 1 x 2 boards alone, the canvas would not wrap neatly around the inside edge. Commercial stretchers usually have a raised outer edge, rounded on the inside. This holds the canvas gently above the rest of the frame. Doing it this way myself would require complicated routing. 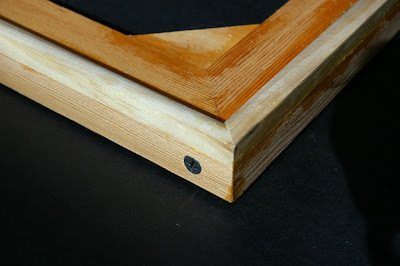 An easy way to accomplish the same thing is to buy pieces of quarter-round molding and attach them to the edges of each frame bar. The one I like to use is not true quarter round, it is slightly wider on one side. The is called a base shoe. The base shoe being glued in place. In woodworking. 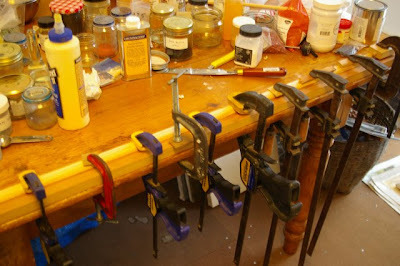 one can never have enough clamps! 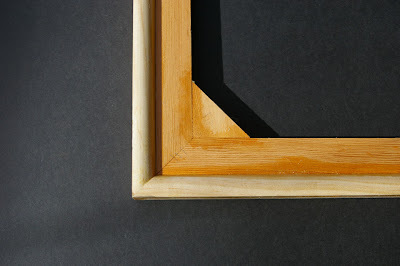 The frame was built with mitered corners. Because of the size, several cross braces were added along with corner braces. Each bar used an alternate face, so if warping does occur, there may be some cancellation effect. It is not a good idea to rely on glue alone to hold a frame together, so all joints were reinforced with screws. 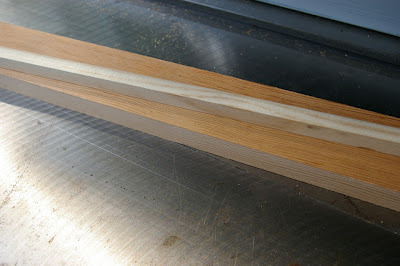 The finished stretcher lies in waiting on the canvas, cut to size. In the final installment, I will stretch the canvas, size and prime it.